– What if Don Juan didn’t goes on hell after his last “love”? I looked over this question in an optimistic vision, somehow pre-raphaelistic , and not in a pessimistic post-modern philosophical view ( If post-modern, I would have needed to think upon Don Juan’s last love as the term itself says : last ..so, the very last of Don Juan love. As he knew that it is the last and to think what would have been his feelings about …well ..I digress … let’s back to the main story…:) So this is my story: what if Don Juan had stopped flying from a flower to another? According to the legend of Don Juan, he didn’t stop to seduce women and his end was in hell… but, being myself a romantic type, I thought that in certain circumstances Don Juan could had been seduced, too and so to find his “the only one” This is about in the “The last love of Don Juan” surreal painting …well, I think that the title should be “The only love of Don Juan” because I think that his all , you know,activity was only a performance not love because I do believe that love suppose devotion, respect and sacrifice (unfortunately, so deprecated these days of exacerbated egoism)…and this is my ending version of the story of Don Juan: I think that Don Juan would find his true love with divine help only. 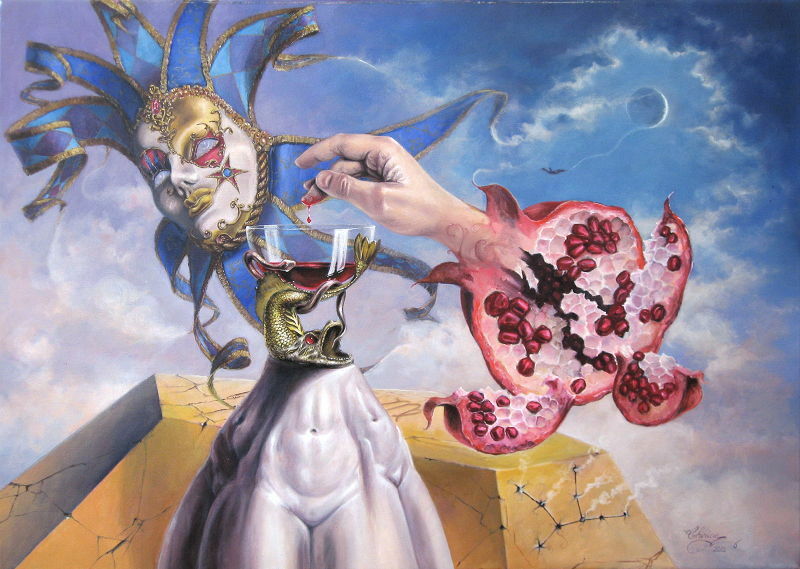 The foreground statuary element including the chalice, the hand and the pomegranate, represents the life of Don Juan as we knew it : full of lust, carnal pleasure, in a continuous hunt to feed the personal pleasure, all of these, under a demonic influence. With the divine help – which is represented by the dodecahedron which is the symbol of the heaven substance (according to Aristotle) – Don Juan found a woman who embodied all the meanings of a virgin (Virgo) Only a perfect Virgo could capture the soul of Don Juan, I think. After that, Don Juan realized that his previous life was just a mask and throw it away and flew for his love on a silver string of the Moon. The Moon itself is at the first quarter which means that the new love is growing. Don’t know if that above that it was in my mind is well transposed on the canvas but I hope I managed at least a half of it. Here is the preliminary sketch of the painting. Daniel, I am so glad to read this because I love your surrealism! Viva Surrealism! yay!! more surrealism! You do everything well, but the world needs this from you, listen to me, you are REALLY great at it! I love this piece! Can’t wait to see the next one! I too, am glad you’re back to doing surrealism! This piece is stunning, breathtaking! I found myself just staring at it & as I moved from one section to another & back,I kept seeing new & marvelous colors, designs, etc. Just gorgeous! Love this painting Daniel. Lots of interest and meaning. Love the guy floating on a string from the moon. Keep up the surrealism I think it is the best.